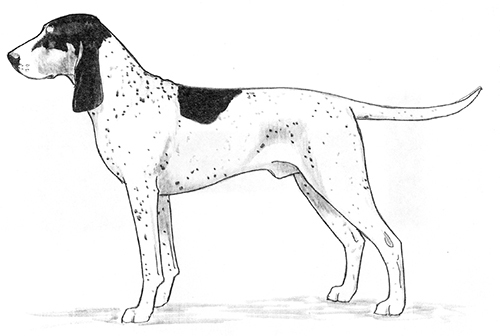 In essence, the Petit Gascon-Saintongeois is a “reduction” of the Grand Gascon-Saintongeois, individuals of which were undoubtedly mated with Airegeois and other local Briquet hounds to achieve their present size and type. At this time, the Petit Gascon-Saintongeois is one of the most rare hound breeds in France. 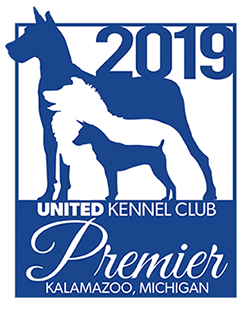 The Petit Gascon-Saintongeois was recognized by the United Kennel Club on January 1, 1993. The Petit Gascon-Saintongeois is bred and judged by the same standard as its parent breed, the Grand Gascon Saintongeois, taking into account that due to a reduction in size, the lines are shorter. Like its parent breed, the Petit Gascon-Saintongeois immediately impresses with its noble air and overall make-up, which serves to combine muscular force with elegance. The first and immediate impression of a Petit Gascon-Saintongeois should be that of a hound with substance and staying power. Considering the breed's hunting history, individual hounds should have moderate bone and ample muscle. Males are heavier than females. Defects such as bull necks, out at the elbows, loaded shoulders or a beef steer profile should not be confused with masculinity. Likewise, defects such as a shallow muzzle, poorly-formed chest, extremely narrow pelvic region and general frailty should not be confused with femininity. Because the Petit Gascon-Saintongeois is first and foremost a hunting hound, scars - the result of honorable wounds - shall not be considered faults, nor shall they be penalized by Judges. This includes cuts, nicks, notches on the ears, and/or ears that are frayed at the edges from working in brush, tall grass, etc. An excellent pack dog with a fine nose, wide casting, and endowed with a sonorous voice. Calm, affectionate and agreeable. The top lines of the skull and the muzzle are divergent. Seen from the front, the skull is domed and rather narrow. The occiput is well defined. Seen from above, the back of the skull is slightly oval in shape. The stop is only slightly pronounced. The cheeks are lean. The muzzle is strong, the same length as the skull, and slightly convex. The lips cover the lower jaw and have closed corners. The edges of the lips are black. A full complement of strong, white, even-fitting teeth meet in a scissors bite. Disqualifications: Overshot or undershot bite. The eyes are oval in shape, and brown in color. The eye rims are black. The expression is gentle and trusting. The nose is always black in color. The nostrils are open and well developed. Faults: Pink or spotted nose. The thin ears are attached very low (below the line of the eye), and well back on the skull. They are well twisted inward and taper to a point. The ear leather length must reach at least to the tip of the nose, and is often longer. The neck is of medium length and thickness. It is rounded at the top, with only a slight amount of dewlap below. The shoulders are long, muscular and moderately oblique. The elbows are close to the body. The forearms have strong bone. The chest is rather broad, long, and deep to the elbow. The ribs are slightly rounded and long. The back is firm and not excessively long. The loin is slightly arched and not too long. The croup is fairly long and slightly sloping. The flank is slightly tucked up. The hindquarters are well proportioned. The upper thigh is long and well muscled. The hocks are broad, well angulated and well let down. The feet are a slightly elongated oval. The pads and nails are black. The long tail is well attached and is carried elegantly in a saber fashion. It is thick at the base and tapers to a point. The coat is short and tight. The skin is supple and not too thick. It is white with black patches. White with black patches, sometimes openly speckled or ticked. The cheeks are pale tan and there are tan points above the eyes and traces of tan on the inside of the ears and in the form of specking on the legs. Some fawn hairs may appear on the upper part of the ears. Sometimes at the base of the upper thigh there is a typical dead leaf marking called a ‘roe buck mark’. Height ranges, measured at the point of the withers, are: males, 22 to 24 inches; females, 21 to 23 inches.